Acrylic Risers are a great way to showcase your products in a prominent display space. Choose your perfect Acrylic Display Case or have them custom made. When setting up POS display stands, it is very important to strike a balance between aesthetic appeal and product focus. Our acrylic retail display stands help you achieve this, by providing a classy crystal clear base that brings your products into focus and does not distract the attention they deserve. Designed using advanced acrylic fabrication processes, our clear acrylic boxes are durable, stylish and customizable. Choose from a variety of acrylic display risers and plastic display stands that will glorify your product at the perfect viewing level. This group of table display stands includes two-step, three-step or four-step acrylic stairways. Available in a variety of shelf depths, these stairways let you easily accommodate different sized products. 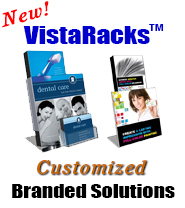 Table top acrylic display stands bring your products into focus. You can also choose the Spiral Stairway that is a design masterpiece that will instantly grab your customers attention and focus on the prominence of your product. Also available is the convenient and versatile Reversible 3 Tier Counter Display Rack that can be used from both sides. Our Tiered Table Displays are preferred by many customers to create an organized stepped display arrangement, or to create a retail display of a category of products. You can opt for simple Round Tables or Square Tables, or go for Three Table Displays, Round Table Displays and Square Table Displays depending on the space in your store. Our clear Acrylic Display Cases are ideal for storing and displaying your high value electronics, jewelry, collectables, bakery goods and other products that need to be protected, secured and easily viewed. Available in many styles and sizes including portable jewelry cases, rotating towers and wall mounted display cases. If you deal in the sales of CDs and DVDs, or own a music store that sells electronic media, our Acrylic Media Displays are a great retail display choice. Available as countertop display solutions as well as wall mounted Slatwall or Gridwall racks, you can choose from multi-tiered Card and Video Racks that come in tilted designs. 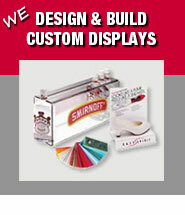 We ship these media displays knocked down, allowing you to easily assemble them in minutes. Choose from Floor Model Card and Video racks, as well as Wall Mounted and Slatwall Card Racks. Ensure high customer impact with in store display solutions like CD 12 Pocket Towers and Mini Tower Showcases. For custom requirements, feel free to call our sales team who can assist you to translate your design ideas into a finished acrylic counter display solution.